If you're keen on motorsport and haven't already been to Motor Show Live, then the next two days are the days to go. Over Friday 4 and Saturday 5 June the show will play host to some of the biggest names in British motorsport well as a plethora of F1 and rally cars. Taking time out from vying for supremacy in the 2004 British Touring Cars Championship to sign autographs for fans will be the champions of the last three years, Yvan Muller, James Thompson and Jason Plato. As well as meeting their heroes, fans will be able to see rally cars on the Citroen, Ford, Skoda, Subaru and Suzuki stands. For lovers of Formula 1, Ferrari, Honda, Jaguar and Toyota will be displaying race vehicles, while there are F1 simulators on the Toyota and Auto Trader stands. Elsewhere, the Nissan stand in Hall 5 will be playing host to Colin McRae’s Dakar rally pick-up. British specialist sports car manufacturer TVR has been selling three weeks’ worth of production of its new Tuscan 2 each and every day from its stand in Hall 6 at The Sunday Times Motor Show Live. By selling 15 of the new cars each day, TVR will soon be reaching for the ‘sold out’ notices for the £39,750 new-comer, to add to the two year waiting list for the TVR Typhon and the 12 month wait for the TVR Sagaris. Ben Samuelson, TVR’s head of marketing and communications, says, ‘The decision to make the world debut of the Tuscan 2 at the British motor show has really paid off. Despite worries about petrol prices and interest rates, TVR will leave the show with the Tuscan 2 sold out until the end of the year. Samuelson attributes much of the marque’s success to its strong residual values. ‘TVR customers will repeat their purchase because they know the car will retain much of its value,’ he says. The success at the show, which reinforces the job security of 450 employees in Blackpool and Coventry, puts TVR in a confident mood as the Le Mans 24-hour race approaches. ‘The Tuscan 2 and the Sagaris will be put in a truck destined for Le Mans as soon as the show closes. They will be on display while our six-strong team of British drivers takes part in the race,’ says Samuelson. The Evo Road and Track Car Gallery is giving eight British performance car manufacturers the chance to show their bespoke models to a whole new audience at The Sunday Times Motor Show Live. By creating the gallery, Evo has given a presence at the show to manufacturers who would not otherwise be able to attend. Found in Hall 8, the stand features 11 cars from Ariel, Deronda, Grinall, GTM, Kamala, Marlin, Westfield, and Ultima. Marlin has been surprised by interest from young people in its Sportster car. ‘It might look old-fashioned but I think they are fed-up with round shapes and want something different,’ says Marlin’s owner Terry Matthews ‘It also helps that you can insure a Sportster for as little as £200,’ she adds. The Deronda F400 is making its debut at the show, while Marlin’s Sexi, launched last December has not been seen in a show environment before. 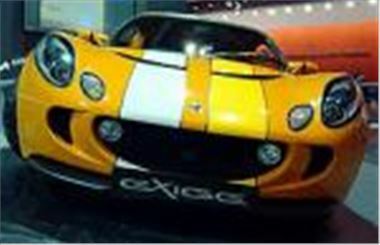 Lotus was celebrating exceptional success within hours of opening at The Sunday Times Motor Show Live, following two customer purchases of a one-off Exige model produced specifically for display at the show. The impressive Lava Orange model, complete with dual striping kit, sold for £35,000 and will be delivered to the first lucky owner immediately after the show. The other owner however, was not quite quick enough and will have to wait until the autumn to get their hands on a replica of the striking version of this high performance car. With a top speed of 150 mph and capable of 0 – 60 in 4.9 seconds, the Exige has proved to be the most popular model for Lotus, with people queuing up to get a piece of the action.